One of our favourite things is working with casts of community dancers for outdoor spectaculars. We’re proud to have received this lovely blog from someone who has worked with Southpaw as one of those dancers. Teresa Kirby, take it away. Aha, so Catherine, who works for Business Durham, also works with Southpaw. But she’s not the only one with a double life. For three days a week, I work for Newcastle City Council in Economic Development and, since 2015, for the other two days a week, I am one of the North East Cultural Partnership Managers. This means that I now, for the first time, am paid for cultural work. Previously, my cultural earnings had consisted of winning 10 second-hand books, when I won a national poetry competition, and £30 for being a dancing customer service assistant, as I danced through the night, for a series of MetroCentre adverts. It has taken an amazing 43 years for me to realise that, although I love both acting and dancing, it is dancing that has given me the most creative opportunities in life. And so I found myself, on my seventh wedding anniversary, dancing with Bullies Ballerinas on live TV at the end of the first day of a summer school at Dance City. And so to Southpaw. This is where I became slightly radical, stepping here away from my careful rule-following path of linear life. You see, I live in Newcastle, not in Sunderland or South Shields – the recruiting ground for Rush, thanks to the funding concerned. But, you know, when you really, really want to do something, you – um – ask. Shy bairns, and all that. And Southpaw said yes! I, literally, could go to the ball. And have a ball I certainly did. I loved the workshops in Boldon with Southpaw. I made some great friends, learnt some fantastic dance moves and, for the first time in my life, got to perform outside. In this case, on Easter Sunday, outside the old engine shed in South Shields, with 100 community and professional dancers, and lots of coloured dust. What a fantastic experience. 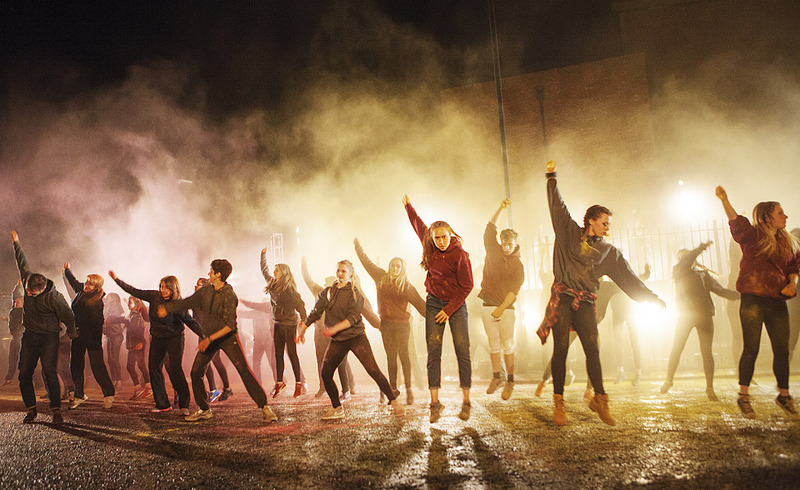 And, to my utter joy, last November, Southpaw staged WordPlay outside The Word in South Shields, and we got to dance all over again, performing exacting choreography with lit balloons, massive film back drops, and loud, industrial music. The crowd went wild. Southpaw is a very special company. They teach members of the public, of any age and ability, how to dance, without watering down the choreography, or being patronising. And, thanks to their production qualities, you become involved in something you can be proud of – for the rest of your life.